Water quality maintenance and weed control on White Lake are financed by a Special Assessment District, and are supervised by the State of Michigan Department of Natural Resources (DNR) and the Department of Environmental Quality (DEQ). The foundation of our chemical treatment strategy during the spring and summer months is routine surveys of the weed growth in all parts of the lake and canals. Based on these surveys, we treat parts of the lake that exhibit excessive weed growth. We also count on - and encourage - residents to phone our Hotline (248.887.5658) to report any weed concerns in the lake near their property. We rarely apply "scheduled" weed treatments, opting instead to treat specific weed problems in specific areas as they occur. For this reason, you may observe weed treatment applied to one area of the lake, while it is not applied to another. Our goal is to not use any more chemicals in our lake than are necessary to maintain an appropriate weed balance. Remember that the lake is not a swimming pool... it is a living, breathing entity, which supports navigation, swimming, recreation, and fishing. Our goal is not to kill every weed, but rather to control the weed growth so that it is not a nuisance. In the last few years, we have been successful in controlling Starry Stonewort with our strategy of stunting its growth, or what we like to call "giving it a haircut". Since it is almost impossible to eradicate it, this is the most successful strategy. On the positive side, the Starry Stonewort growth has dramatically reduced the growth of Eurasian Milfoil. Our lake appears to be reaching an equilibrium between these two. 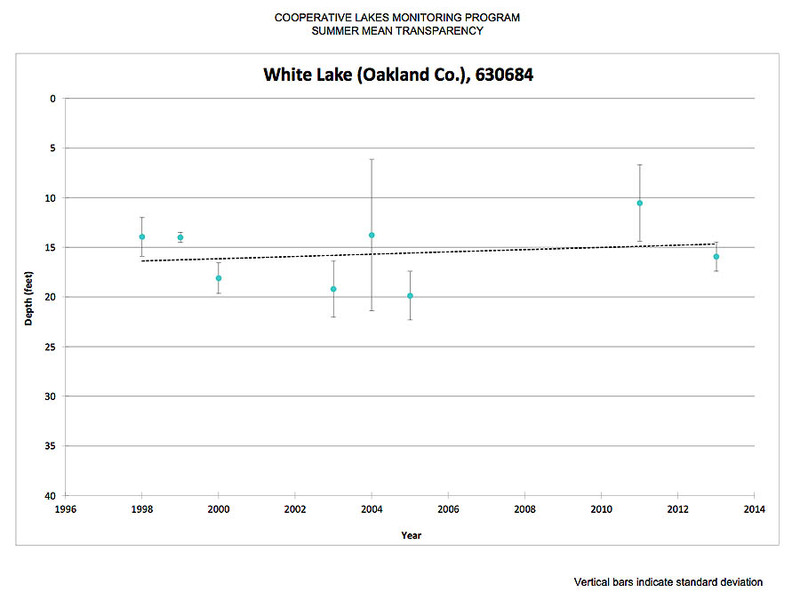 The White Lake Citizens League participates in the Cooperative Lakes Monitoring Program (CLMP) sponsored by the Michigan Clean Water Corps. The Michigan Clean Water Corps (MiCorps) is a network of volunteer monitoring programs in Michigan. It assists the Department of Environmental Quality (DEQ) in collecting and sharing water quality data for use in water resources management and protection programs in the state. 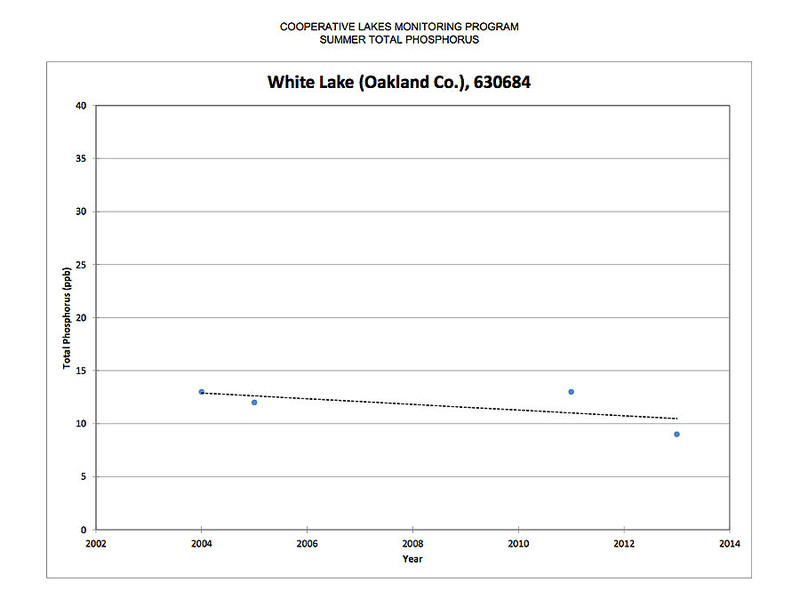 The graphs below indicate positive (improving) trends over several years for Summer Total Phosphorus and Summer Mean Transparency CLMP Program measurements, both important measurements of the "health" of a lake. Click on each graph to view an enlarged version. The State of Michigan mandates a Lake Management Program Report, filed by a certified professional, following the application of Fluridone. Click here to view a copy of the 2009 report. This testing gives us a yardstick to measure progress, and provides the state with information for an effective database. Visit the Fishing page for information about Fishing Advisories and consumption of fish from White Lake. Fertilizer Numbers - What Do They Mean? On some northern Michigan inland lakes that are deep and do not have any bottom weed structure, there is a practice of putting Christmas trees out on the ice to mark fishing holes. When the ice melts in the springtime, the trees sink to the bottom (hopefully) and provide structure for the fish. This is NOT a good practice on White Lake! Our lake is shallow, and sunlight provides ample weed structure. Please dispose of your tree using your routine refuse pickup.